Few people from the top premier colleges are starting political parties. Most of them are not successful. A friend of mine explained why it is little difficult for them to do it. Most of the highly intellectual people talk at very high level. What is the economic policy of India, what is our status on foreign relationships etc. A common man never bothers about those. Each person has their own set of problems. They have problems like water, current, roads etc., If they face those problems, and if anyone solves those, then they will start supporting him/her. It does not matter whether the person is good or bad, takes bribe or not. If he/she is going to solve their problems, then people are going to support them. That's it. How many of the highly intellectual people are going to solve their simple problems. The same reason why Manmohan Singh lost to Vijay Kumar Malhotra in South Delhi. Vijay Kumar Malhotra is a well known person there, and the people knew him since 1977 (In 1977, he was first elected as MP from South Delhi). Manmohan Singh is a highly intellectual person. But, he cannot solve their local problems, where as Vijay Kumar Malhotra can. So, they elected him. In politics, one needs to have lot of commitment and patience. We cannot show the results in one day or one month or even one year. We have to spend decades to change the system. If it had been that much easier, many people would have changed it long time back. 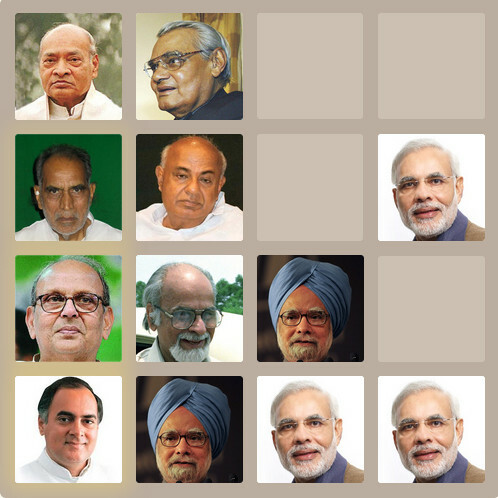 It is not trivial to change 30% of the Indians (to form a government at center). The commitment is lacking in the highly educated people. They should work for their vision every week continuously for years. If they work for few weeks, and then stop for few weeks, then it will not work out. Except in the case of Loknayak Jayaprakash Narayana, there is nobody who has changed the system in less than a decade. Of course, Indira Gandhi's mistake was also a main reason in his success. Jayaprakash Narayana (of Andhra Pradesh) started Loksatta around 12 years back. And now, it is in a situation to contest at all the places in Andhra Pradesh. It took 12 years to reach this situation. If a handful of people wants to change the country overnight, either they have to bring a very big celebrity, or bring crores of rupees. If it had been so simple, the country would have been in much better position long time back. This story tells us something about LOVE & LIFE. My husband is S/W Engineer by profession, I love him for his steady nature and I love the warm feeling when I lean against his broad shoulders. You love traveling but always lose your way in a new city . I have to save my eyes to show you the way. So, take the following test presented here and determine if you are losing it or are still "with it." OK, relax, clear your mind and... lets begin. Don't scroll down until you have the answer and dont cheat! If you said "water" then proceed to question 3. Answer: Greenhouses are made from glass. If you said "green bricks," what the devil are you still doing here reading these questions? If you said "glass," then! go on to Question 4. Anyway, during the flight, TWO of the engines fail. The pilot, realizing that the last remaining engine is also failing, decides on a crash landing procedure. Unfortunately the engine fails before he has time and the plane fatally crashes smack in the middle of "no man's land" between East Germany and West Germany. Where would you bury the survivors? East Germany or West Germany or in "no man's land"? you are a real dunce and you must NEVER try to rescue anyone from a plane crash. Your efforts would not be appreciated. If you said, "Don't bury the survivors", then proceed to the next question. Answer: Oh, for crying out loud! Don't you remember your own name? It was YOU! Read the question carefully. Now pass this along to all your "smart friends" and hope they do better than you did. These are the statistics of this blog in 2008. Andhra and Telangana - Who will be benefitted? The copyright of Mahathma Gandhi's books is expired. Now, anyone can publish Gandhi's books without paying any royalty to anyone. Before entering politics, Chiranjeevi discussed with Dr.Jayaprakash Narayana on politics, and Dr.JP joining him. At that time, Dr.JP had told him that, if Chiranjeevi is coming to change the existing politics, then he would be ready to make Chiranjeevi as the Chief Minister. But, if he wants to start a party which is like yet another party, then Dr.JP would not help him. Chiranjeevi did not accept his proposal, and formed his own party. Eventhough I knew this long time back, I was waiting for public information. Now, this news is made public by Dr.JP himself on the occassion of Jhansi Lakshmi joining Loksatta. This installer is supported only for 32 bit OS. It is not supported for 64 bit OS. For the development of the sharepoint application, I have used Visual Studio 2008 Team Suite, Sharepoint Server 2007 and Windows Server 2008. Open Visual Studio, Select File -> New -> Project. 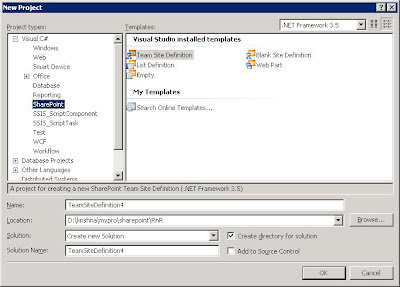 In the dialog, Select Sharepoint -> Team Site Definition, and enter the name, location and click Ok.
Once the solution is created, add a new item. 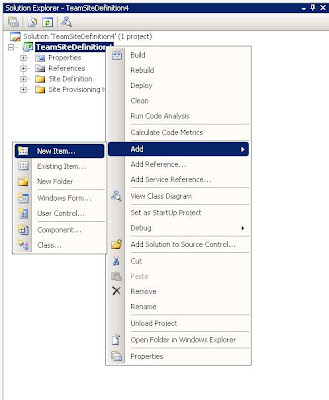 and Select Visual C# -> Sharepoint -> List Definition and click Ok. This will show the following dialog. Select Custom List and check Create an Instance of this List. If you want to add an event handler, you can check Add with Event Receiver. Once you click Ok, it will show the following in the solution explorer. Open instance.xml, and add OnQuickLaunch="TRUE" Description="Krishna List Instance" as shown in the following. If you want, you can add VersionEnabled and EnableMinorVersions as attributes of List tag in schema.xml. To deploy the application, Press F5. It will create wsp file and deploy the application. If you are using windows 2008 server, it may give the error Access Denied while deploying the application. To deploy the application, run the following commands from the command prompt. In windows 2008 server, the command prompt should be run as Administrator. While creating the sharepoint instance, if you have not selected, Add with Event Receiver, then you would receive the following error message. You will get the above error, if you do not have any C# code to be deployed. In that case, run the following command. Go to Site Actions -> Create. 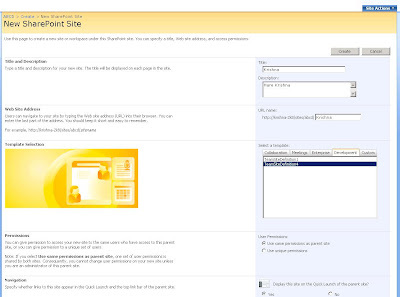 It will open Create page of sharepoint. In that select, Web pages -> Sites and Workspaces. Enter title, description and URL name. 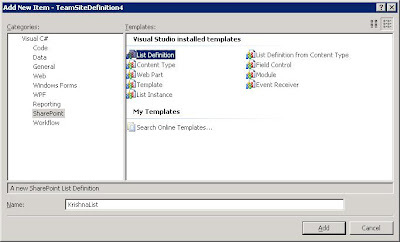 Select a template -> Development contains the solutions that we deployed. Select that template and click ok. It will create the sharepoint application from our template. "Our company has never fired even a single employee so far. But, at the same time, we have never faced this kind of recession."